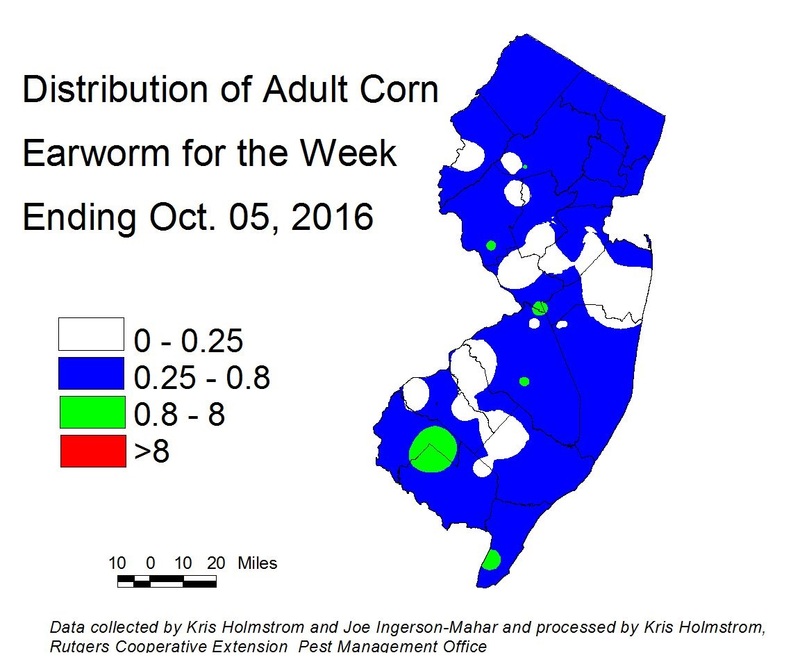 Corn earworm moth (CEW) activity has been fairly steady over the past week. Patches of locally higher activity remain within a generally low population (see CEW map). Catches are now rising and falling with night time temperatures. It is advisable to incorporate materials into the spray program that have different modes of action from the pyrethroids. This includes IRAC 28 materials like Coragen, Exirel and Besiege, as well as IRAC 5 (Radiant, Entrust (OMRI approved), and Blackhawk)). Growers should be checking CEW activity frequently, and adjust spray schedules according to local activity. On this map, green areas correspond to a 3-4 day silk spray schedule, while blue is 4-5 days. 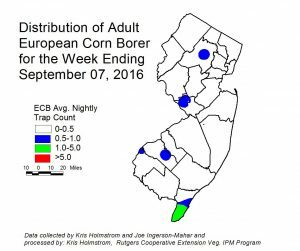 European corn borer (ECB) moth numbers have decreased this past week such that only a handful of moths were captured. There are no particular areas of higher activity, and no map will appear in this edition. It is unlikely that we will realize any further injury from this pest this season. 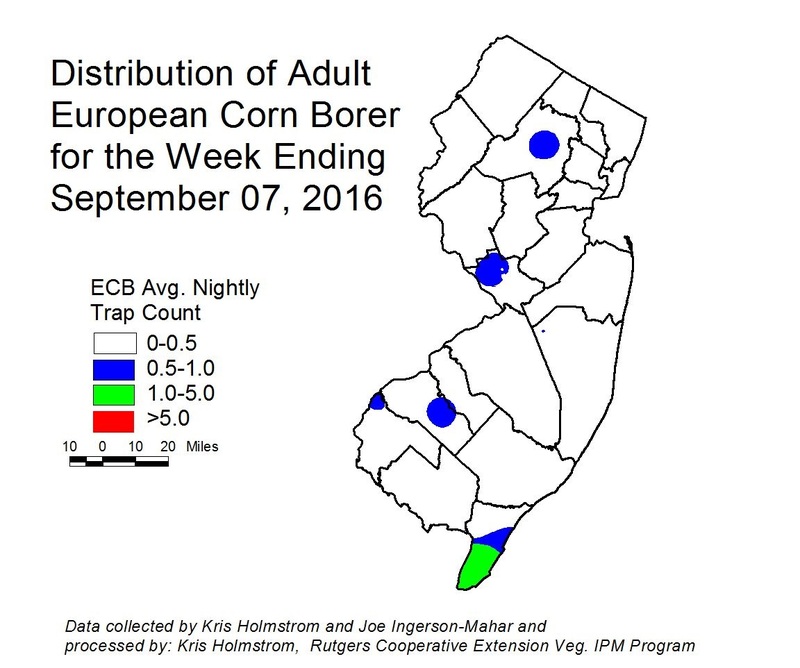 European corn borer (ECB) moth numbers increased slightly this past week. At the present time, highest activity is in western areas from the Delaware Bay shore northward to Warren County (see ECB map). This partial third flight should not present much of a threat to host crops. This is particularly true in light of the dominance this year of fall armyworm (FAW). FAW will probably remain the larger threat, and treatments for this pest will eliminate ECB in the process. See the 2016 Commercial Vegetable Recommendations Guide for insecticide choices. There has been little change in the fall armyworm (FAW) situation in the north and central areas. Joe Ingerson-Mahar indicates that re-infestation rates in younger corn in the southern counties have declined somewhat. Infestations continue throughout NJ, with damaging infestation rates in all parts of the state. We should expect this pest to be with us for the remainder of the sweet corn growing season. Treat when FAW alone or in combination with ECB damage exceeds 12% plants infested. FAW do not respond well to pyrethroid insecticides. The most useful products are those in the IRAC group 28 class (Coragen, Exirel) or the IRAC group 5 class (Radiant, Entrust), or combination products including these classes. See the 2016 Commercial Vegetable Recommendations Guide for insecticides effective against FAW.